Aging is not an option…Looking old is!!! The amount of collagen and elastin your skin produces decreases as you age. This causes changes that are subtle at first. You may have already noticed loose skin and fine lines appearing around your eyes. Gradually these lines become more visible and the changes become more pronounced. Your face also loses volume (fat and muscle) with age. Your cheeks become less plump, and as they deflate, the skin falls and looks saggy, causing deep folds from your nose to your mouth (nasolabial folds) and mouth to chin (marionette lines). You get the idea. Aging and gravity may be unavoidable but medical aesthetics offer a strategy that works against these relentless forces of nature. Surgery used to be the only option for skin laxity but technical advances provide safe non-surgical treatments that will lift and tighten sagging skin in the face and jaw. Dermal fillers refill areas that have lost volume or appear hollow, and this then pulls up the face naturally. 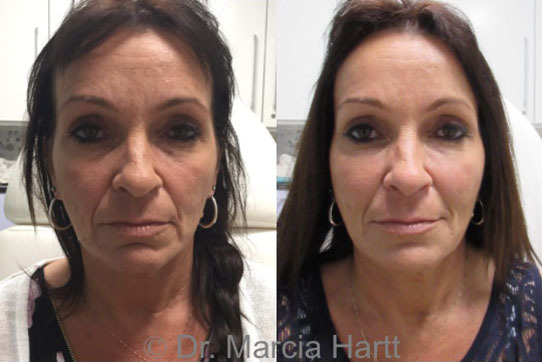 Dr. Marcia Hartt takes pride in the natural-looking results she’s able to attain for her patients. Her artistic application of dermal fillers replenish the fullness of your face exactly where it’s needed. Anti-aging treatments such as microneedling, Infrared Skin Tightening Laser, RadioFrequency Fat Reduction Laser, and Erbium Fractional Resurfacing Laser can each create collagen to thicken and tighten skin. 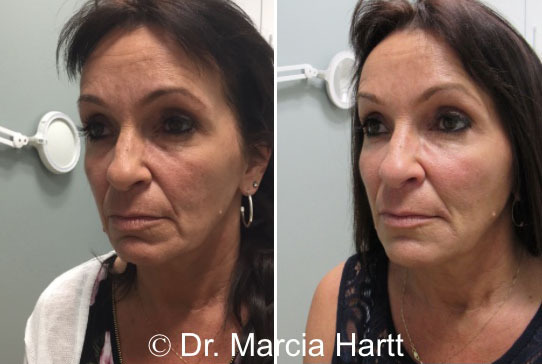 Let Dr. Marcia Hartt introduce you to the exciting treatment options that will take years off your appearance yet look so natural it will be hard for anyone to say exactly what’s different. Now that’s a strategy worth taking advantage of. Visit the Before and After Gallery to see how natural the results will look. Treatments for skin laxity include: dermal fillers, Botox® Dysport, microneedling, InfaRed Skin Tightening Laser, and Erbium Fractional Resurfacing Laser. Explore your options – book your free consultation with Dr. Marcia Hartt today!